Building log homes for a green tomorrow! At Expedition Log Homes we are at the forefront of incorporating as many green building practices into our log homes as possible, while still making your custom log home affordable. As you review one of the most important pages on this web site-"Building Green", please keep in mind that while Expedition Log Homes has many green features already designed into our standard materials package we are constantly striving to learn more about how we can make Expedition Log Homes as green and affordable as possible! Also, when designing your Expedition Log Home - Midwest we take great care in finding ways to incorporate as many green options into the overall design of your home. Expedition Log Homes feels that the green building phenomenon has two sides that are very different. You have all kinds of companies- including log home companies that say they are green just to say it, this is used as a way to catch your eye! These companies are just feeding off a media-hyped hunger of what consumers think they want and by hearing the word green they know consumers will be attracted to them just because they say the word! The second type of green companies are ones who take a more logical and gradual approach to learning and incorporating as many green building practices and materials into the products they offer to a well informed consumer. At Expedition Log Homes we are the second of the two options! While everyone wants everything green right now, we know that this is not only impractical but it is also not cost effective for most consumers in the current economic market. BUT with that being said, Expedition Log Homes also knows that we can incorporate green into a large portion of our design systems, our building materials, our recommended building practices, and our general company policies. Expedition Log Homes looks at green as a three prong system that must be followed by all three parties to be a green success. 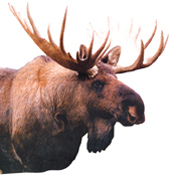 The three prongs of this process include: 1-the company-Expedition Log Homes, who's practices, designs, and materials make-up a portion of what goes into a green project, 2- the contractor, who will control exactly how the project is built- including the on-site materials they purchase, sub-contractors they choose, job site policies, etc., 3- the consumer- this is you! And this is the most important of all three. You will choose the companies that give you the green designs and materials you want in your project while still keeping your project affordable and on budget. You will choose the contractor that will build your Expedition Log Home - Midwest to the green standards you require. You will incorporate your lot design and development to assure that it meets the green efficiencies your green requires. You will make choices that will affect the overall cost and budget of making your new home green. But, most importantly- YOU choose to make a difference by building a home that is practical and efficiently green. A home that will help future generations have the same opportunity you have had to build that "dream home", and at Expedition Log Homes we will be by your side to guide you the process of "building green"! Please understand that while Expedition Log Homes has many green aspects built into your homes design and materials package that are standard, you will also have the opportunity to choose optional items that can make your home even more green. While these design options and materials typically cost you more in both the package and the builders cost, you will have the option of making the home as green as you can make it! 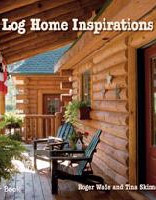 Below you will find what makes Expedition Log Homes green. You will also find out what you and your builder can do to make your new Expedition Log Home green. Please check back to the news & events page on a regular basis as we will be adding and updating any new green ideas to this page as we implement them into our design and building system. You can also direct your green suggestions or ideas to us by going to our Log Home Information page and filling it out and placing your suggestions in the comment box at the bottom of the page. We look forward to hearing from you! 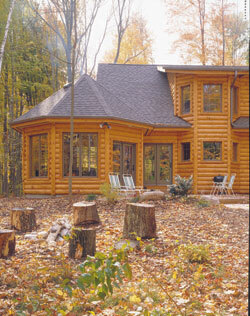 The most obvious factor that makes Expedition Log Homes green is that our building materials come from tree's. The majority of our raw stock comes from certified managed forestlands (farmed, second or third generation lumber) in the state of Wisconsin which has over five million acres! Our mill/manufacturing process utilizes ALL portions of the log. All bark & wood chips are used for landscaping mulch. Sawdust is used for animal bedding . All slab wood and cut-off's are reprocessed for pallet stock(in-house) and are ground for animal bedding. The standard Expedition Log Home - Midwest package includes the use of engineered wood products in our conventional building systems for floor joists, beams & headers, sub-flooring, and studs in gable end walls and in areas of high wind load applications. Engineered wood products are pre-engineered and pre-stressed and come from younger tree's that are used to help provide a more sustainable and quicker renewable resource. Expedition Log Homes uses high density insulation in walls and ceilings and when it is incorporated into our Insulated Half Log building system can give R-values greater then R-30 in walls and over R-40 in roof systems. We can also suggest insulation systems that can give you R-values much greater than this. Adding this to our Half-Log Building System makes Expedition Log Homes one of the most energy efficient wall systems in the industry! Expedition Log Homes encourages the use of water based stains, finishes, cleaners to better enhance and complete the green building process. Expedition Log Homes always tries to suggest and create floor plans that help to maintain the home functionality and create an effective building envelope using proper ventilation, thermal continuity, and adequate air infiltration sealing. Uses building dimensions to minimize material cuts & waste. Encourages covered entries and porches to prevent water intrusion. Use recommended roof overhangs-Expedition Log Homes uses 24" overhangs- STANDARD. Use drip edge at eave and gable ends- STANDARD. Supply ice flashing at roof edge- Ice & Water Shield-STANDARD in Expedition packages. Require proper ventilation and thermal continuity- which is an ABSOLUTE MUST to eliminate condensation and ice damming. The items listed above are just some of the things Expedition Log Homes does to make your home more green and you can count on us to look to the future to constantly improve the green aspects of our designs and material offerings. The contractor is the single most important person outside of yourself that will help you achieve the level of green home you desire. Choose them wisely! Be supportive BUT also practical in green building, so as to be able to offer you cost effective and realistic pricing as to where green building does and DOES NOT make sense! 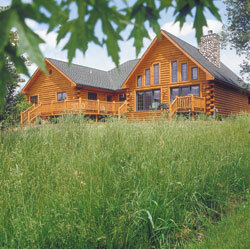 YOU are the single most important factor in achieving the green Expedition Log Home you desire! Maintain wildlife habitats-you will be glad you did! This is a good overview of what you can expect with building your green Expedition Log Home. Please understand that this is meant to give you ideas on where to start and what to do. You will have many additional options beyond what is mentioned here and our job at Expedition Log Homes is to educate and assist you on what level of green is right and cost effective for you. Please call us with any green questions at 1-800-426-5647 or email jay@logdreams.com.